This adds new members to a Workflow upon completion of another Workflow (optionally matching their exit value). 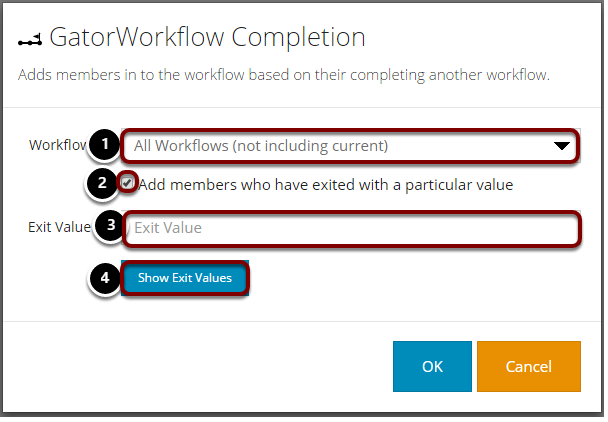 This allows members to complete Workflows and join another on their exit. By dragging the Gator Workflow Completion stage to the canvas the above screen will appear, allowing you to search for exits and values of all Workflows within the system. Select 'Match exit value' only if you would like to find people that exited another Workflow with a particular value. Otherwise just hit OK. If you don't know the exit value, you can click this to see a list of exit values used within the Workflow(s) in item 1. For more information on Exit Values please see Exit Stage.